Not many teams lose their last four regular-season games and earn their first bowl berth since 1994. That was the story of Duke in 2012. If one counts the loss to Cincinnati in something called the Belk Bowl, the Blue Devils have dropped five in a row. That's no cause for celebration in most places, but merely making a bowl is big news in Durham. Consider that Duke was winless four times in the 11-year span from 1996-2006 and won a total of two games in the three seasons before David Cutcliffe became coach. Cutcliffe, entering his sixth season, is only 21-40, but this basketball-first school is more than happy with the results. November has been unkind to Duke and David Cutcliffe. 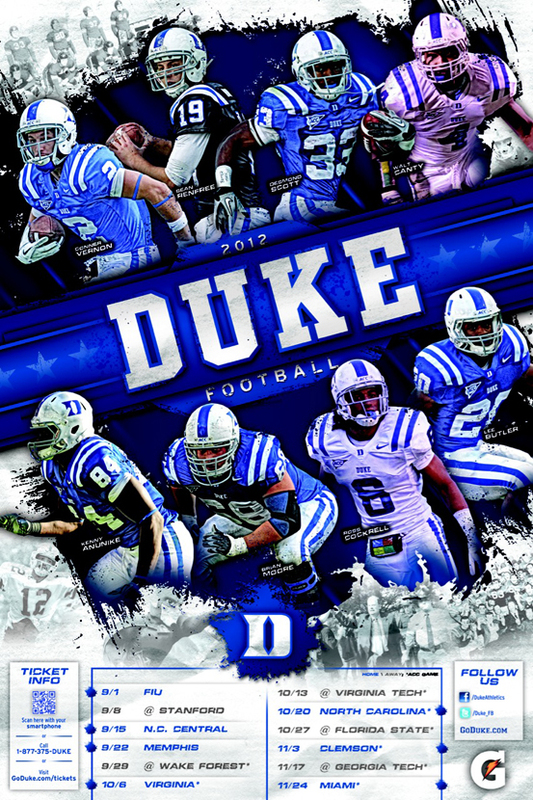 Since Cutcliffe became coach in 2008, the Blue Devils are 1-12 in the month. Duke hasn't been to a bowl game since 1994 and was set to end that skid in 2009 when the team entered November with a 5-3 record. But as form would have it, the team lost all four games. Overall, Cutcliffe is 15-33. The team enters 2012 saddled with a seven-game losing streak. The Blue Devils will have to win a bunch of games early if they are to entertain any hopes of ending the bowl drought. Perhaps incoming freshman Hud Mellencamp, the son of rocker John Mellencamp, can help. The younger Mellencamp, who did not play high school football but was an accomplished boxer in Indiana, plans to walk on as a defensive back. Click the image to enlarge. Thanks to Mike. Superfan and Wiz correspondent Greg Laughlin's second game of his Saturday college football doubleheader took place in Durham, N.C., where Stanford took on Duke. The Cardinal rolled to a 44-14 victory behind Heisman candidate Andrew Luck. There are more photos after the jump, and you can view Greg's complete gallery by clicking here. Duke has made considerable progress under David Cutcliffe, who enters his fourth year as coach with a 12-24 record. It is the program's best three-year stretch since Steve Spurrier went 20-13-1 from 1987-89. Things were bad in Durham from 1999-2007, a stretch that saw the Blue Devils win only 13 games. At one point, Duke backed out of the final three games of a four-game series against Louisville because the Cardinals were simply too good. Louisville sued for breach of contract, seeking a penalty of $150,000 a game, but Duke attorneys won the case by arguing that its team was so bad, scheduling any opponent would be a suitable replacement. That puts in perspective what David Cutcliffe has accomplished in his two seasons as coach. He is 9-15, including a 5-7 record last season. The Blue Devils' next step is finishing with a winning record and ending a bowl drought that dates to 1994. It might not happen in 2010. The schedule features home games against Alabama and Miami and a trip to Virginia Tech. Then we turn it over to readers, who will vote on the poster of the year. In the meantime, send your team's poster schedule to jayzuma (at) gmail.com. Thanks to Mike! Update: The deal with David Cutcliffe fell through and Tennessee is expected to hire Derek Dooley of Louisiana Tech. David Cutcliffe, who was an assistant at Tennessee from 1983-98 and 2006-07, is Tennessee's likely choice as its new coach, according to the Knoxville News Sentinel. Cutcliffe, 55, has spent the past two seasons at Duke, leading the Blue Devils to records of 4-8 and 5-7. Before his arrival, Duke was the worst program in a Bowl Championship Series conference for a 10-year span, with only 13 victories over Division I-A teams. Cutcliffe was Mississippi's coach from 1998-2004, going 44-29. The Rebels played in five bowl games, winning four. He has a reputation for developing quarterbacks, having coached Heath Shuler, Peyton Manning, Eli Manning and Erik Ainge.